Just because Steph LeClair and Kristen McKenzie waited until the last minute to audition for The Amazing Race Canada doesn’t mean you should. With the deadline for submissions happening on Thursday, Dec. 1, the pair dispensed valuable hints to improve your odds of being selected for Season 5. But where the girls have their next year or so plotted, they were anything but coordinated when it came to auditioning for Season 4. “We hemmed and hawed and waited until the last minute,” Kristen admits. “We thought, ‘What’s the point? We’re never going to get picked. '” With just one night available to film their audition, the couple—after returning home from dinner out and imbibing in some wine—plopped down on their apartment floor and talked to the camera. “It literally took us just a couple of hours,” Steph says. “The clip is only three minutes, so leave some bloopers in and show your personality. It doesn’t have to be perfect or include graphics or anything. Don’t overthink it.” That latter note, overthinking it, plagued the duo at first. A list of recorded bullet point items came off as too scripted and robotic, so they had a conversation, chirping good-naturedly. “Once we said, ‘To hell with it,’ we had fun and were ourselves,” Kristen says. That included disclosing they were in a relationship, a unique angle producers look for in casting. If you are lucky enough to be chosen, the real work begins. But even then, it’s almost impossible to know exactly what to prepare for when challenges and countries visited is such a wild card. Still, there are some general things to work on before the five-week adventure begins. Steph and Kristen worked out, ran up and down their condo building’s stairs wearing weighted knapsacks, boosting the stamina needed not only to outlast other teams physically but strengthen their mental game too. The deadline for submission is Thursday, Dec. 1, at 11:59 PM ET. For all casting details and updates, including instructions on how to submit an audition video, fans can visit CTV.ca/TheAmazingRaceCanada, the CTV Facebook page, and follow @AmazingRaceCDA. After travelling around it, Steph LeClair and Kristen McKenzie are on top of the world. The couple, who captured The Amazing Race Canada title during a wild final Leg in Montreal on Tuesday, were all smiles during a spate of media interviews on Wednesday. As they explained during the After the Race special, they plan to pay off Steph’s legal school debt, travel for nine months and perhaps put a downpayment on a property. Here’s what they told us about their experience. The Montreal leg … congratulations to the producers for coming up with a wide range of physical and mental challenges for the final three teams to do. The bagel challenge was deceivingly difficult. Kristen McKenzie: Yeah, physical, mental and navigation. They’re all very different beasts and that was a real combo. How hard has it been to keep your win quiet? KM: It’s been so hard, especially because my sister and I are so close. That was the most difficult for me and challenging. Steph LeClair: She was So. Mad. KM: She was. She was like, ‘Really?! You couldn’t tell me?’ But I wanted to experience it with her and have it be a surprise for everyone. It was a fun moment last night. I think it was harder when we first got back because we had all of these amazing things that we wanted to tell all the people that we love. You said last night on the after show that Steph is going to pay off her school debt, nine months of travelling and maybe buy a property? SL: Well, travel for sure. And for sure debt. It’s especially great to pay that off because, being in this with Kirsten, I felt like it was a bit of a burden on me. I don’t want money to ever be an issue between us so it’s a relief to do that. And travelling, 100 per cent. And then coming back and figuring out what we want to do and where we want to end up. If the time is right, maybe buy something. KM: We’ll definitely save some. We didn’t have this money before. We have it now. We can work for the rest of our lives and this as an opportunity that we can’t waste. I’ve never travelled before and I got bit by the travel bug on the Race, but it’s not really travelling because you can’t really take it in, although we tried as much as possible. We’re so grateful and feel so lucky; we want to make the most of it and create memories and not just get stuff. Are there some countries on your must-travel list that were some of the places you visited during a Leg of The Amazing Race Canada? SL: Our list is probably 15 pages long. We’d definitely love to travel within Canada. The first time we went to the west coast was on the Race. We loved Haida Gwaii and I’ve never been to Vancouver. Jasper… I’d go back in a heartbeat. And the east coast. We’d love to stay in Canada, but we’d love to go back to Vietnam. SL: We took our very first vacation to an all-inclusive in Cuba, and then that happened [Steph cut her finger on a machete and has the scar to show for it] and I don’t know if I want to go back to Cuba! 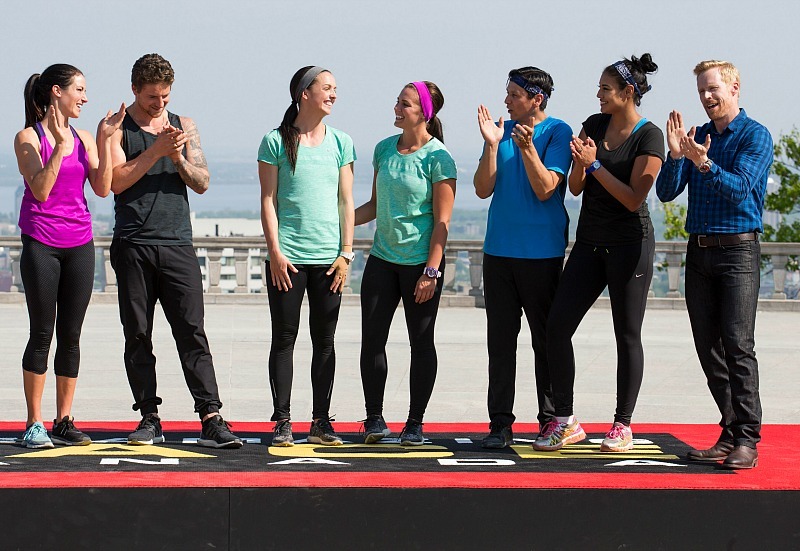 Coming from a softball background, teamwork came into play during The Amazing Race Canada. Even when you did get frustrated with each other, it didn’t last long. That was part of your game plan, I assume? SL: It’s hard because it’s so stressful. But you have to really learn to take it in, get a grip and move on. We definitely had moments, but at the same time, we had to reign it in. KM: I think our biggest asset was our communication and the way we treated each other and supported each other. I felt supported the entire time. This, I think, has been the most evenly-matched set of teams this show has ever had. You were battling it out with Jillian and Emmett all season, and Joel and Ashley were right in the mix too. Those teams really drove you all season long. SL: … and that didn’t work! KM: And then we ended up in the finale together. Frankie and Amy were sneaky good too. People underestimated them, but we didn’t. SL: They flew just under the radar enough to chip away and were in the thick of things. Are you friendly with the other teams? Have you kept in touch? SL: Yeah, we actually have a group chat going on all the time. It was really fun to see everyone again last night. We went to an after party after the finale. It was so fun to see everyone. KM: Brandon and Anthony watched the first episode at our place, so we’re good buddies with them. Frankie and Amy watched at our place when they were kicked off because they were in Toronto. We visited Antoine in Montreal and Jill came too. There are no hard feelings anywhere.